T0day I finally got around to installing the recent iOS updates on my iPhone. Both my iPhone 6 that usest Straight Talk’s AT&T network and my iPhone SE that uses Straight Talk’s Verizon network were still using iOS 9.3.5 so I was two updates behind. The iOS 9.3.4 and iOS 9.3.5 updates are important because the contain security patches for some serious security vulnerabilities that were recently found. Normally I just write an article when I do an update but today I decided to do a video too. You want to make sure our data didn’t get really slow after the update and the picture messages is still working. 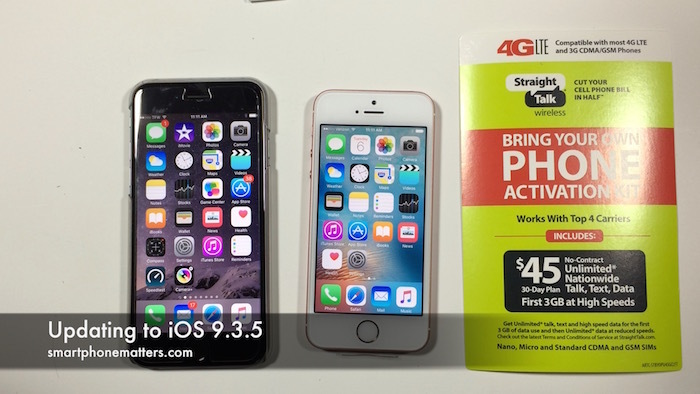 I update both my iPhone 6s and iPhone SE and did not have any problems. With iOS 10.0 coming so soon, some of you may be tempted to not install iOS 9.3.5 and just wait for 10.0. I’d suggest the opposite, install 9.3.5 now and hold off on iOS 10.0 to see what problems other people have.